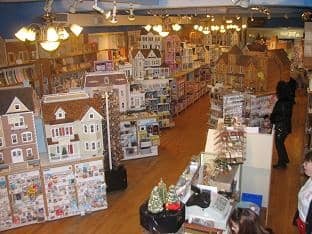 Doll House, Dollhouses, and Dollhouse Kit Supplier and Distributor for Miniature Dollhouses in Ontario Canada. We are the leading supplier of Dollhouse Miniatures in North America and major Canadian markets for over 35 years. Shop our lines of miniature doll house furniture, miniature doll house accessories with top brands such as Bespaq, Reutter, Real Good Toys, Greenleaf and Corona Concepts to name a few. We also make our own Made in Canada Dollhouse Kits in Ontario Canada. Buy and save on all dollhouse kits with our best price guarantee, plus FREE SHIPPING over $100 in Canada and US! (doll houses and dollhouse kits excluded). Let TheLittleDollhouseCompany become your number 1 online shopping destination for all of your dollhouse miniature needs. We are among the top 5 real stores in North America by size and selection, so please come in for a browse. We cater to kids and kids at heart. From the most novice to seasoned miniature collectors. With 85 built doll houses for sale on display, you can see exactly the materials used and how your kit will turn out. With countless doll house wallpapers, dollhouse flooring, miniature furniture, miniature lighting and every accessory and doll house building supply imaginable, we are the one-stop-shop for everything miniature. Come to see our 5000 square feet shop and workshop, we can assure you there in nothing else like it this side of the border. We'd love to see you and advice is always free. And don't forget to peek into our workshop, we always have something cool on the bench! FOR OUR CANADIAN CUSTOMERS-BUY CANADIAN, ALL OUR DOLLHOUSES AND DOLLHOUSE KITS ARE SHIPPED FROM CANADA in CANADIAN $$$, AVOID HIDDEN BROKERAGE AND SHIPPING FEES. FOR OUR AMERICAN CUSTOMERS ALL YOUR ORDERS ARE SHIPPED FROM OUR BUFFALO, NEW YORK LOCATION, NO TAXES, NO DUTIES. We custom build, wire and decorate our doll houses in our on-site workshop. Come and ask us any dollhouse building questions or join us in one of our workshops. Note: We are in the process of updating our pages to a new better system, and as a result a large portion of our inventory is still to be added. Do come into the shop if you can to see the whole range or give us a call with whatever you are looking for - I bet we have it. Please feel free to contact us via E-mail or telephone should you have any questions about this site or any kind of dollhouse building or dolls house decorating questions.